Wow, it has been an absolute wild weather ride for Texas and Florida the last couple of weeks. Even if you don’t live there, chances are you have family members and friends who do. Add to that, the fires in Washington and California, the severe drought in Montana, and you may be like me, very worried about our world and its residents. I think in these times people are looking to spread positivity, if there is anything good to come out of these catastrophic weather events, it is the way people have pulled together to help. I mean even in New York where I live, they are having clothing drives for the displaced Texans who lost everything in Hurricane Harvey. Now, I am sure, more people will band together to help Floridians get back on their feet. One way to help our planet every day is to make sure everything you purchase for yourself or as a gift makes a positive impact. Clothing is something we all buy and yet, some manufacturers are not doing the right things. 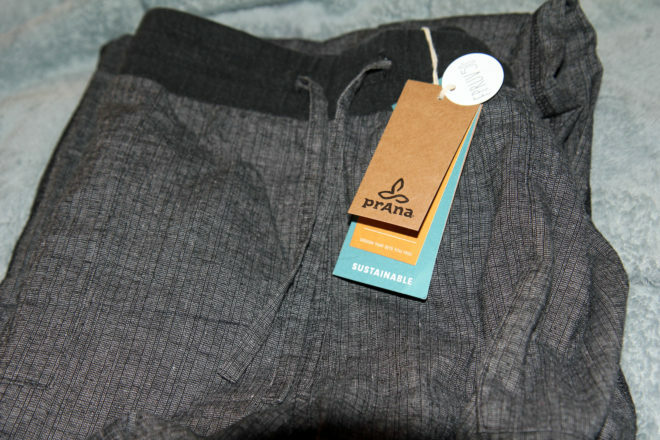 Recently, I ordered some items from prAna, they offer organic, hemp, sustainable and fair trade items that you feel great about wearing and giving for gifts. The company’s mission is to give people the option of reaching into their closet and dressing in items that reflect who they are. I was pleased to browse their site, and see clothing that I could dress up or down. Pieces that had the versatility to go from hanging out on the weekend to a night on the town easily. With the weather changing so quickly here in the northeast, it seems we embarked on fall well before we were ready to say goodbye to summer. Little did I realize, I would be embracing my new Daria Sweater Hoodie as soon as I did. It is so soft and comfortable. The sweater is woven from a lightweight organic cotton in a fine gauge knit. It is oversized which makes it great for layering. The perfect sweater to cheer my little ones on from the sidelines of the soccer game. I can wear a turtleneck underneath or wear it alone to change-up the look or for added warmth. Adding accessories can customize the look for wherever I am going. I love the big front pocket to keep my hands warm and the hood adds some fun flair. The Manta Pants I ordered are my new favorite pants. They are made of a hemp and recycled poly blend woven with 3% spandex for extra mobility. The waistband is constructed from an organic cotton and hemp blend knit and features an adjustable internal drawcord to give me a secure fit. They are cut with a mid-rise and straight leg that give me that relaxed fit I love. They are so comfortable and the black herringbone color I chose dresses them up without compromising comfort. I can easily wear them out to run errands, attend meetings at the school, or to coffee with a friend, and they are my first choice to wear when spending a lazy day at home. I think the versatility of prAna’s clothing is what appeals to me most. It really fits my lifestyle since I work from home and am a wife and mother of 5. Being able to change the look of an outfit quickly with a few accessories, is something that I need to be able to do, and prAna gives me the pieces I need to do that. Whether my day’s adventures lead me on a hike in the mountains with my family, scouring our local farmer’s market for the best produce or meeting with the marketing agent of a company I am working with, my prAna clothing fits me and whatever I am doing perfectly. I think it works so well because all the designers create and test all of prAna’s clothing based on their own love for outdoor activities. If this all sounds good to you, you can use my exclusive discount code MS15CM to take 15% off your prAna order. As a blogger working with Modern Social Magazine, I was provided with the prAna clothing in order to facilitate my review. As always, my views and words are 100% my own. The weather was breezy but nice in the Harbor Side Park in DUMBO. The bright orange yoga mats were set up directly across the Manhattan skyline with a perfect view of the Statue of Liberty. I am used to taking power yoga at my home studio but have been craving a slower flow and the teacher, Kelly, absolutely delivered. The poses she recommended were perfect to completely stretch out the body no matter if you were a novice or a very practiced yogi. The class was very welcoming and provided a nice retreat from the chaos of the city. Miz Mooz showcased some very fashionable styles for fall and each blogger was sent home with a very comfortable espadrille style flat which I have been using for commuting on the PATH. The shoes are comfortable and fashionably perfect for the city. I had an absolutely amazing experience sharing this class with all of the awesome bloggers and want to thank Miz Mooz for their hospitality and the great shoes and goodies we all got to take with us! To see all the gorgeous Miz Mooz fall shoe styles visit their website and connect with them on Facebook, Twitter, Instagram and Pinterest. Gaiam Watercress Aluminum Water Bottle Review and Giveaway!!! Are you drinking enough water? It’s so important to drink water throughout the day especially during any type of exercise. Are you tired of drinking from plastic bottles that just create more plastic garbage for landfills? Do you want a water bottle that’s easy to clean and made of high quality materials without toxins? If you answered yes to the last 2 questions, then you should check out the Watercress Aluminum Water Bottle from Gaiam. The wide mouth of this bottle makes it easy to add ice cubes and to clean thoroughly. The durable stainless steel is durable, non-toxic and 100% recyclable. The bottles are BPA free and have no need for an inner lining. Making a difference is as easy as changing how you drink your water! WHY STAINLESS STEEL? 86%t of plastic water bottles used in the United States end up in landfills, taking up to 1,000 years to biodegrade. Americans are currently adding 30 million PET water bottles to our landfills every day. Transporting bottled water consumes approximately 1.5 million barrels of fossil fuels per year. Help reduce this number by carrying a refillable bottle. When you use a stainless steel bottle, your water remains free of unhealthy plastic residues. Gaiam is sponsoring a giveaway on Mommy Ramblings! One lucky blog reader will win their own Watercress Aluminum Water Bottle! Thanks to Gaiam for the review bottle and for sponsoring this great giveaway on Mommy Ramblings!!! Open to US residents. Marika, Balance Collection For Yoga Review!!! My daughter has recently become very passionate about Yoga. She is in graduate school and it is a major stress reliever and keeps her in great shape. She goes as many as 6 times a week. She has been expanding her Yoga wardrobe and recently tried out some items from the Marika Balance Collection. She chose the Marika Tek – Artificial Reality Galaxy Print Leggings and Marika Tek-Solid Intuition Tank. She remarked immediately with the softness of the tank and how it was softer and felt better than a brand she buys that is much more expensive. She loved the leggings too, they were comfortable and fashionable and stayed put no matter the pose. She even found they were nice to wear outside of class paired with a different top. If you are looking for multi-sport active wear you should check out Marika. Use Promo Code BRIGHT40 to get 40% off all bottoms. Get 30% off your Balance order with code RELAX30. You can follow Marika Fitness on Facebook and Twitter to stay up to date on sales, promotions and all the latest news. I received the above pieces at no cost from Marika in order to facilitate my review. As always the opinions and views are entirely my own. MPG Performance Clothing Review and Giveaway!!! MPG has effectively blurred the lines between fashion and performance. Truly powerful action is the result of an equally passionate vision and drive to achieve. Behind the energy for perfection surges the will to attain it. In recognizing this balance, MPG has developed a line of clothing that seamlessly blends fashion and function, design and performance. The results are richly detailed pieces with a technical edge — an entire collection unparalleled in conception and construction. I was recently contacted by MPG to pick a top and bottom to review. I have to say it is true that they have blurred the lines of fashion and performance and there were so many pieces to choose from. After browsing for a long time I picked the Lina French terry pullover top and the Yoga-Toner high-waist pant. The pieces are comfortable for working out and for just around the house or out to the store. They are stylish, fit great and look great. Core-strengthening designed women’s active workout high-waist pant. MPG has also provided Mommy Ramblings’ readers with an exclusive discount code for 25% off all non-reduced merchandise at their online boutique: use the discount code mpgfall2012. MPG is sponsoring a giveaway on Mommy Ramblings. One lucky blog reader will be able to choose the top or bottom of their choice from the MPG website (subject to availability and excluding outerwear). Thank you MPG for the review pieces and for sponsoring this fit and fabulous giveaway on Mommy Ramblings!!! Open to USA and Canadian residents. I recently received an Aurorae Northern Lights Yoga Mat with Golden Sun Focal Icon in Passion to review. The innovative design is said to awaken the energy within you. Mat is made with PER Eco Safe Material, is biodegradable and Phthalates free. I love the extra long length of this mat, it is 72 inches long. The mat is 24 inches wide and 5 mm thick to absorb impact on joints. Aurorae is the #1 best reviewed yoga mat with a 5 star feedback. Each individual mat has a uniqueness of its own and no two mats are exactly the same. The unique design replicates the natural phenomenon and energy source of Northern Lights. I really like the look and feel of this yoga mat. My kids love it too, and like to do stretches and forward rolls on it when I have it out. The very generous Aurorae Yoga is sponsoring a give-away on Mommy Ramblings. One lucky blog winner will win their very own Northern Lights Yoga Mat with Golden Sun Focal Icon. Thank you Aurorae Yoga for the review mat and sponsoring this awesome give-away on Mommy Ramblings. Extra Entries-Make sure to leave a separate comment for each one or they will not count. 2. Like Aurorae Yoga on Facebook, and leave me a comment here that you did. 3. Follow Mommy Ramblings on Twitter, and leave me a comment here that you did with your Twitter name. 4. Follow Aurorae Yoga on Twitter, and leave me a comment here that you did with your Twitter name. 5. Subscribe to Mommy Ramblings by email and leave me a comment here that you did. 10. Like Blueberry Hill Photography on Facebook and leave me a comment here that you did. Good Luck Everyone!!! Give Away Ends August 27th at 12am EST. Winner will be selected by Random.org. Recently I received The Yoga Garden Game from YogaKids to review. This beautiful game was created by Jennifer Durand and is a cooperative game and fun learning tool. The game is designed to help children plan and learn yoga in the Parents Choice award winning YogaKids style. The Yoga Garden plants seeds for a lifetime of harmony, peace and well being. This game is really great because kids naturally love to move and enjoy yoga. The objective of the game is to plant a flower in the garden before night fall. As the players travel around the board they learn classic yoga postures, and have the chance to invent their own. The Yoga Garden pose cards show the different poses and since they are named after animals and objects found in nature it provides a natural springboard to develop their imaginations and awareness, while learning the different poses. As parents we like our kids to be active and have fun while playing and learning. This game is fun but also provides physical exercise, learning and creativeness that we as parents try hard to foster in our children. The game is for ages 4 and up and the illustrations on the board are so beautiful it really is a work of art as well. YogaKids has generously provided Mommy Ramblings with another Yoga Garden Game that we will be giving to one lucky blog reader. Would you like a chance to win this great game? If so follow the give-away rules below and good luck. This is open to US residents. Mandatory Entry-Go to the YogaKids Website and let me know another product of theirs you like. Leave your choice in a comment on this post. (This entry must be done or all others will not count and be deleted). 2. Like YogaKids on Facebook, and leave a comment on their wall that Mommy Ramblings sent you. Then leave me a comment here that you liked them on Facebook. 4. Follow YogaKids on Twitter, and leave me a comment here that you did with your Twitter name. 6. Vote for Mommy Ramblings on Picket Fence Blogs (Button is on the side of our blog, “We’re on the Fence) and leave me a comment here you did. 7. Vote for Mommy Ramblings on Top Mommy Blogs (button is on the side of our blog) and leave me a comment here that you did. 8. Post this give away on your Facebook status and leave me a comment here that you did. 9. Tweet this give-away on Twitter and leave me a comment here that you did with your Twitter name. Good Luck Everyone!!! Give Away Ends July 5th at 12am EST. Winner will be selected by Random.org.